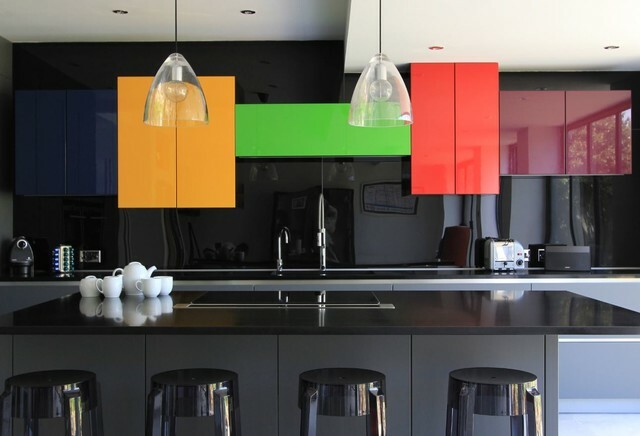 By far the most striking features in the kitchen are the 'pop colour' wall hung cabinets on the main wall. These units are bespoke high gloss lacquered in marine, mustard, lime, coral and plum. Although the units look randomly placed, the kitchen was designed using a German grid system that provides ultimate symmetry of design. Against the backdrop of the highly reflective surfaces the taps sit above the under mounted stainless steel twin sink and the additional boiling tap provides instant hot water. The island features a black gloss quartz overhung work top providing a breakfast bar, an induction hob, and a down draught extractor. Built in are a wine-cooler as well as a dishwasher that cleverly projects lit numbers on to the floor to show how much time is left in the wash cycle. The side wall bank of full height and built in storage with pull out drawers features both a conventional and combination oven. The floor is finished in large format grey tiles that cover the entire open plan lounge and kitchen area.